1 Million for Work Flexibility has more than 100 organizations on board to date as part of our coalition—and counting. 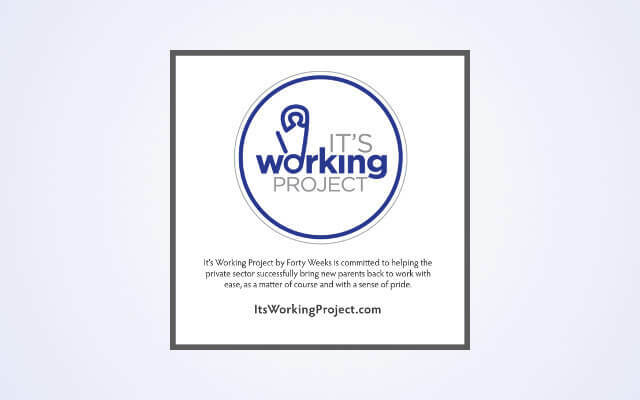 We’re pleased to share more information about our supporter, the It’s Working Project, in this Q&A. Hundreds of products—from breast pumps and double strollers to diaper bags and nursing pillows—aim to make life easier for new parents. But not one of those items can help moms and dads deal with the realities of returning to work after their baby is born. Julia Beck had seen that challenge since 1999 as she led FORTY WEEKS, which provides strategic and tactical guidance to brands with an interest in the expectant and new parent market. She knew all of the problems caused by this lack of support. As one peruses the website for the project, it’s not hard to see what those working parents really need. For example, 1MFWF’s own Emma Plumb talks on the site about her life turning “topsy turvy” when her daughter was born, as she sought her own new definition of flexibility. In this Q&A, Beck talks about her own family’s history with parenting and flexibility, as well as the future of the It’s Working Project. 1MFWF: What is your personal history with work-life balance, parenting, and flexibility issues? How has that affected your philosophy and that of the It’s Working Project? It’s Working Project: I am the matriarch of a blended family—in short, I have a husband, four children, and a dog—and life is hectic. I have never stopped working, volunteering, and being engaged to the very best of my ability. It is sometimes exhausting, and most days, extremely rewarding. And I know I am lucky—my circumstances give me options that are rare and hard to come by. Being self-employed, for example, gives me the ability to set my own hours and treat my employees in a way that creates long-term respectful relationships. My deliverables are what is measured, not my hours. A few years ago my father was quite ill and eventually in hospice before he passed. I was able to just be where I needed to be, with my family. No questions asked. And that is an extraordinary freedom. And that makes the bigger picture even more clear—this is not our national standard, not even close. 1MFWF: What makes the It’s Working Project unique? What do you do that no one else does, for both parents and companies? It’s Working Project: We LISTEN! Our goal is to gather stories from parents told in the highly personal, first-person narrative. We ask about experiences through the lens of the moment—good and bad. We take that candor and begin to not only make sense of trends and concerns to share with employers (most have low-cost and high-return fixes), but we also validate personal experiences by being part of a community of others who have gone through similar experiences. 1MFWF: How are you setting the example in the way that you work, for individuals and companies who work with you? It’s Working Project: Like the clients we work with, we are highly solution-focused. And while we are small, we try and stay mighty—providing just what is needed in real-time! For example, we cherish working-parent mentors. We know that paying it forward is essential. We also know that parents who have recently “been there” have the most valuable insights and strategies to share. We are forever making introductions! 1MFWF: What is the biggest challenge facing working parents today, based on the input from those who share their stories with you? What are companies doing to help them overcome that challenge? It’s Working Project: There is not one single thing. I will say it all comes back to culture. Organizations that actively promote a culture that supports individuals as whole people are providing the necessary environment for successful employees. Simply having policy on paper without authentic support does not work. Having strong policies for some, but not all, does not work. The culture needs to underscore the true value of employees. Further, this is not a women’s issue. All of us will find ourselves in need of a strong support system within our work ecosystem. It needs to be there when a parent is ill, a sibling requires our focus during a surgery, etc. It is all of us, not just women—all of us. 1MFWF: What are your future plans for the project? It’s Working Project: What a wonderful question! I have been engaged in a great deal of writing—and that has been fantastic—from the Washington Post, to Slate and Harvard Business Review. I have been doing deeper dives and loving it. The content is opening more doors, and that is always a worthwhile exploration. Expect to see us more involved with the policy side of things as well—the issue of National Paid Family Leave is not going away; in fact, just the opposite! Of course, we continue to build new strategies and programs for private-sector employers. From enhanced pumping spaces to formalized peer mentoring programs, we continue to take small investments and meaningful inventions and make them work many times over. While 2017 was the year of “Transparency,” I expect 2018 to be the year of “Pride.” Forget compliance. Organizations will bring their A-game to cultivating environments that not only recruit and retain talent. They will take great pride in telling their story, the one in which they care for all employees and value the whole of their organizational culture—and that will be with us!